Northwest Philadelphia has dozens of shops and stores offering products and gifts for kids that are as unique and wonderful as they are. From children’s books for all ages in Germantown to classic candy in Chestnut Hill, these 13 shops have everything any kid could ever want. Give the gift of art! ARTrageous Brush & Flow offers children’s paint events, including private parties for up to 10 children. Kids can choose from a number of different paintings to create, and all canvases, paint and supplies are included. Got wheels? Barr’s Bikes & Boards does! Not only does this shop offer bicycle repairs and tune-ups, but you can also find new and used bikes for all ages (adults included! ), and ready-to-go or build-your-own skateboards, too. Plus, they have all kinds of accessories, from helmets and pads to baskets and lights. There’s plenty of children’s books at Big Blue Marble Bookstore on Carpenter Lane in Mt. Airy. The shop, which is open every day of the week, and regularly open during the evening for special events, also has weekly storytimes for little ones. Located in the quiet Maplewood Mall section of Germantown, Books & Stuff grew out of a weekend book vending experience to a fully-realized storefront. This shop has features books with a primary goal of showcasing multicultural experiences for children, teens and adults, with the largest selection of Afrocentric children’s books in Philadelphia. The shop also carries puzzles, magnets, journals, and more. This fun and friendly comic book shop offers a personal shopping experience, giving one-on-one attention to everyone who walks in through the doors. They offer a huge selection of American comics, as well as Japanese manga, and fun illustrated tee-shirts, too. Treat the kid in your life to a day of play at Kids at Play in East Falls. This indoor playground offers a sensory gym, ball pits, a zip line, slides, swings and more to give your little one loads of fun. Drop-in playtime is available regularly, and membership is also available. This adorable little gift shop in Manayunk has perfect presents for any occasion, including little ones! From fun and educational books to stuffed animals, puzzles, activity kits and toys, there’s a surprise for all ages at this store! Footie pajamas? Check. Onesies? Check. Fluffy stuffed animals? Check. 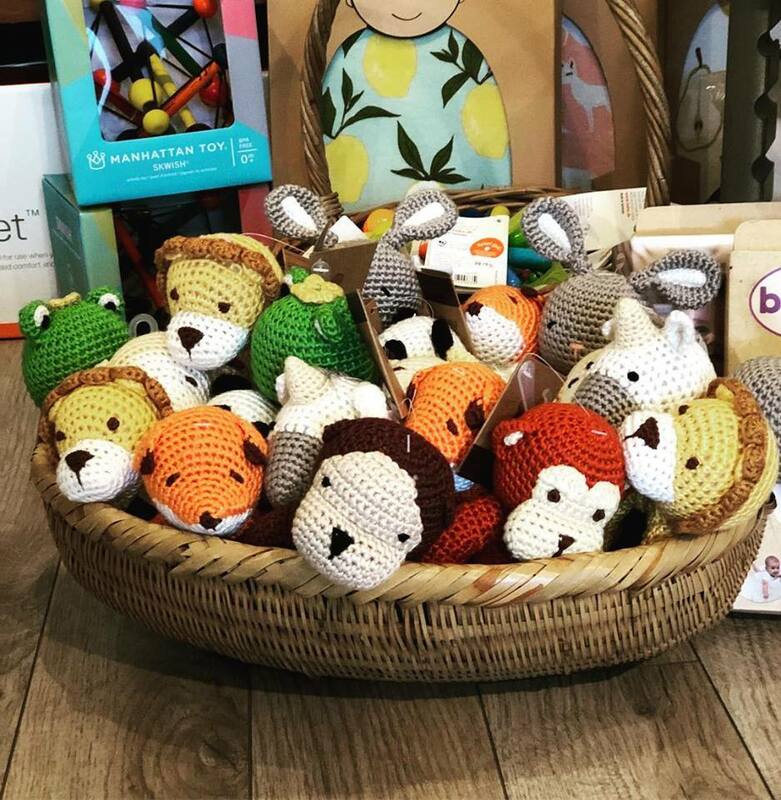 Little Apple, the boutique gift shop on Main Street in Manayunk, has the most adorable items for babies and toddlers, along with a shop full of adult gifts. This environmentally-minded boutique not only sells gently-used baby clothing, toys, accessories and furniture, but they also buy it from customers! They also offer all kinds of new baby and children products, including toys, shoes, books and more. This toy shop in the heart of Chestnut Hill offers modern and speciality toys like shape sorters, wooden blocks, dolls, dress-up accessories and so much more. You’ll find creative and educational toys for kids of all ages, from newborns to college-age students, and new stock is always added. From teething and crawling supplies to books and gift sets, Pineapple on Main has a full section of mom-approved gifts for new babies and toddlers. Favorite items include rubber duckies with trendy sayings, and rubber bibs to make cleanup a breeze. Have a budding musician in your midst? Head to Rawk U School of Music in East Falls offers guitar, drum, piano, bass and vocal lessons for all ages. You can also sign kids up to take part in their ‘Summer Band Camp’ weekly sessions, where students of like mind and ability get together for two hours a week, once a week, and put on a show at a Philadelphia venue. While this co-op is mostly known for local and organic food, including bulk food and fresh produce, it has a nice selection of children’s toys in the shop, too. And for fun activities visit their website for hands-on workshops for kids and kid-friendly events. You’ll find all kinds of gently-used children clothing at this boutique in Manayunk, from newborn baby onesies to school-aged children clothing. Worn Yesterday has a selective buying process, which means that only the best boutique-style clothing makes it into the shop. Plus, they have maternity clothes for soon-to-be mothers, also. This tiny candy shop is an institution in Chestnut Hill, with loads of locally-made chocolate. They also offer fun retro candy, international candies (like imported licorice from around the world), lollipops, molasses paddles and more.